A common challenge that many independent hoteliers and consultants of the hospitality sector have to face is to balance the relationship between direct and indirect booking. The threat of OTAs (Online Travel Agency) in undermining a possible share of revenues associated with the opportunity of establishing a direct relationship with travelers, should motivate the accommodation facilities to invest in a strategy to increase direct bookings. Ever since their establishment OTAs have, without a doubt, benefited from poor pricing controls and distribution policies by the hotels, making 75% of travelers convinced of the idea that the best rates are only on OTAs (source: tnooz.com). A study carried out in 2016 showed that in 53% of cases the rates are cheaper on the Hotel’s Official Website than those proposed by intermediate portals (source: tnooz.com). Today the result is that OTAs have increased their turnover, therefore Hotels have to pay more commissions and must invest more resources to persuade travelers to book directly. Travelers choose to book through OTAs for three main reasons: the perception of being able to find the “Best Rate Guarantee”, the supposed ease in the booking process and familiarity with the brand. How to grab travelers who have a tendency of booking with OTAs? Regardless of the different techniques implemented, the first step is that of adopting an effective Hotel Marketing strategy, focused on the development of direct selling as a first distribution channel. ATTRACT» CONVERT» SHARE is the strategy to attract travelers on the Official Website and get them to book through Hotel booking engines, establishing consumer loyalty to the facility’s brand. Once the strategy and main objectives are defined, the key to convince online visitors is the “Value”: it must be conveyed that visiting the Official Website and booking directly through the booking engine has more value than the experience offered by OTAs. It would be best that users not consider the possibility of abandoning the Hotel’s Website in order to consult other channels and show that they can book at a better rate compared to the price/value ratio. Let’s take a look at four systems of persuading travelers. As already stated, many travelers are unaware that Hotels often offer the best rates and terms on their Official Website and therefore think that they’ll find cheaper rates on the online travel agencies. Hotels must reassure consumers that the best rates for their accommodation is available on the facility’s online booking system. It must be clear for travelers who visit the booking engine that a better price is impossible to find elsewhere. Therefore, it is important to have a booking engine with a price comparison system, such as the NOZIO V2R online booking System. Website users will not have to check the rates of other distribution channels or on Metasearch engines such as Trivago, Tripadvisor, Google Hotel Ads because they’ll already know that they’re making reservations at the best possible option. Who said that the lower rate is the winning rate? Playing down with prices is dangerous and threatens to devalue the position of the accommodation facility. It’s best to offer equal rates and worthwhile offering an extra benefit to travelers. Include key elements at high added value for users, such as Wi-Fi, free breakfast and a room upgrade. They are all effective incentives and at an affordable price for Hotels (definitely less than a 20% commission on the reservation). It’s important to give visibility to the special deals by promoting them, for example, on social networks or activating retargeting campaigns with Google AdWords to customers who have looked at a booking engine but ultimately have not yet booked. According to a recent report (source: koddi.com) if the price is the same as proposed by the OTAs 65% of travelers prefer to book directly with the Hotel. For this reason posting the rates of the booking engine on Metasearch engines such as Trivago, TripAdvisor or Google Hotel Ads is an effective sales opportunity. In order to post the rates you must enable visibility campaigns on the different metasearch engines. 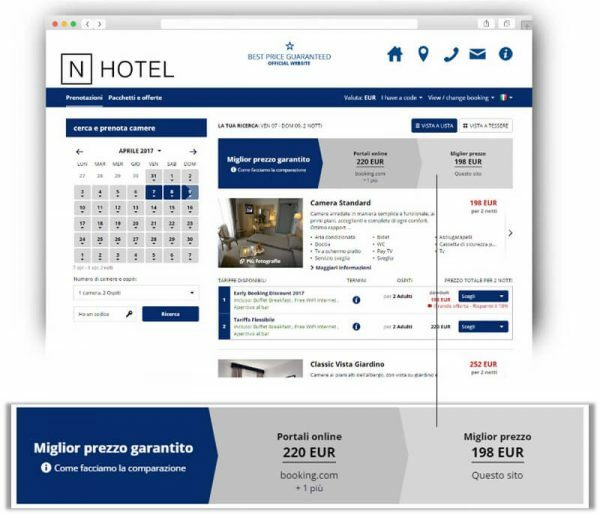 Thanks to the Nozio Premium Advertising & Price service you can immediately begin to receive direct bookings from Metasearch engines. The Official Websites have an advantage compared to the reservation experience proposed by OTAs to travelers. In fact, the intermediary portals are overloaded with information, notifications and leverage psychological mechanisms designed to give a sense of anxiety in travelers. Independent Hotels, however, can openly communicate with users, providing them with anamazing and coherent experience on fixed and mobile devices. A Website and a responsive booking engine make the difference in these cases. 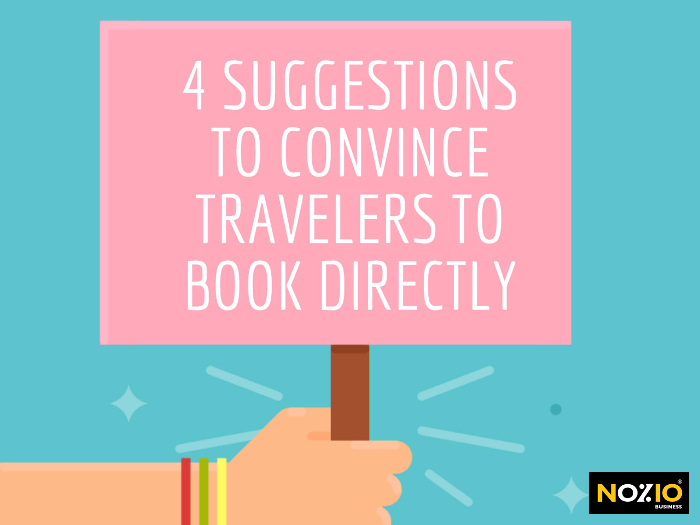 These are just some functional suggestions to convince travelers to book directly, modifying their mental attitude that OTAs always have better deals than those available through direct Hotel channels. Do you have other strategies to share? Write to us on our social channels!